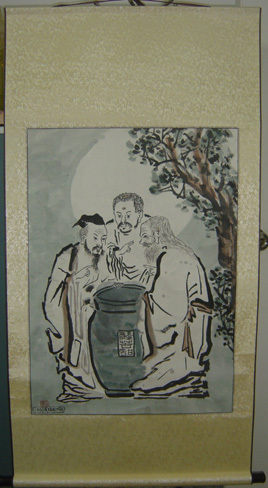 The Vinegar Tasters painting is the most popular painting related to taoism. It was made even more famous when the book "Tao of Pooh" mentioned this piece of art. Three men are standing around a vat of vinegar. Each one has dipped his finger into the vinegar and has tasted it. The expression on each man's face shows his individual reaction. Since the painting is allegorical, we are to understand that these are no ordinary vinegar tasters, but are instead representatives of the "Three Teachings" of China, and that the vinegar they are sampling represents the Essence of Life. 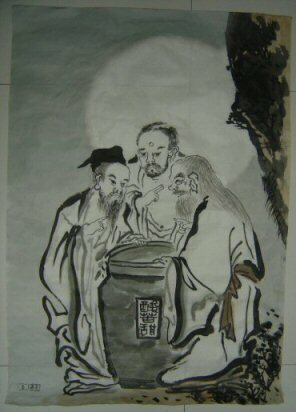 The three masters are Confucius, Buddha, and Lao Zi, author of the oldest existing book of Taoism. The first has a sour look on his face, the second wears a bitter expression, but the third man is smiling. To Confucius, life seemed rather sour. He believed that the present was out step with the past, and that the government of man on earth was out of harmony with the Way of Heaven, the government of, the universe. Therefore, he emphasized reverence for the Ancestors, as well as for the ancient rituals and ceremonies in which the emperor, as the Son of Heaven, acted as intermediary between limitless heaven and limited earth. Under Confucianism, the use of precisely measured court music, prescribed steps, actions, and phrases all added up to an extremely complex system of rituals, each used for a particular purpose at a particular time. A saying was recorded about Confucius: "If the mat was not straight, the Master would not sit." This ought to give an indication of the extent to which things were carried out under Confucianism. To Lao Zi, the harmony that naturally existed between heaven and earth from the very beginning could be found by anyone at any time, but not by following the rules of the Confucianists. As he stated in his Tao Te Ching, the "Tao Virtue Book," earth was in essence a reflection of heaven, run by the same laws - not by the laws of men. These laws affected not only the spinning of distant planets, but the activities of the birds in the forest and the fish in the sea. According to Lao Zi, the more man interfered with the natural balance produced and governed by the universal laws, the further away the harmony retreated into the distance. The more forcing, the more trouble. Whether heavy or light, wet or dry, fast or slow, everything had its own nature already within it, which could not be violated without causing difficulties. When abstract and arbitrary rules were imposed from the outside, struggle was inevitable. Only then did life become sour. To Lao Zi, the world was not a setter of traps but a teacher of valuable lessons. Its lessons needed to be learned, just as its laws needed to be followed; then all would go well. Rather than turn away from "the world of dust," Lao Zi advised others to "join the dust of the world." What he saw operating behind everything in heaven and earth he called Tao (DAO), "the Way." A basic principle of Lao Zi's teaching was that this Way of the Universe could not be adequately described in words, and that it would be insulting both to its unlimited power and to the intelligent human mind to attempt to do so. Still, its nature could be understood, and those who cared the most about it, and the life from which it was inseparable, understood it best. Over the centuries Lao Zi's classic teachings were developed and divided into philosophical, monastic, and folk religious forms. All of these could be included under the general heading of Taoism. But the basic Taoism that we are concerned with here is simply a particular way of appreciating, learning from, and working with whatever happens in everyday life. From the Taoist point of view, the natural result of this harmonious way of living is happiness. You might say that happy serenity is the most noticeable characteristic of the Taoist personality, and a subtle sense of humor is apparent even in the most profound Taoist writings, such as the twenty-five-hundred-year-old Tao Te Ching. In the writings of Taoism's second major writer, Zhuang Zi, quiet laughter seems to bubble up like water from a fountain. 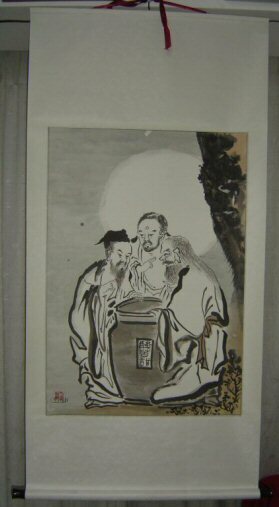 In the painting, why is Lao Zi smiling? After all, that vinegar that represents life must certainly have an unpleasant taste, as the expressions on the faces of the other two men indicate. But, through working in harmony with life's circumstances, Taoist understanding changes what others may perceive as negative into something positive. From the Taoist point of view, sourness and bitterness come from the interfering and unappreciative mind. Life itself, when understood and utilized for what it is, is sweet. That is the message of The Vinegar Tasters. Note: For scrolls only, not posters. The scroll is actually painted by a master painter in China and actually shipped from China with many layers of protective material. It is placed inside a plastic protective tubing (see image) and shipped inside another cardboard shipping box. 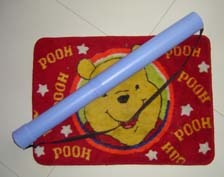 The plastic tube doubles as a scroll transporter and for long term storage of the scroll. All the paintings come in a scroll style, so pictures below that do not look like a scroll are previous serials numbers that were not offered a scroll format. A scroll allows you to roll up the painting for storage or transport. The dimensions of the painting in the scroll is about 2 feet wide and 3 feet tall. If you include the scroll part, add another 2 feet to the height. If you wish to purchase more than one, please click on the "Buy Now" button separately for each purchase. 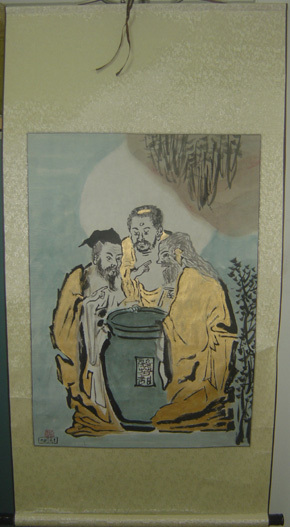 Here are the immortal people who have limited serialized paintings of the "Three Vinegar Tasters" (Golden Edition) by a master painter in China. Clicking on the "Buy Now" button above will allow you to purchase your own Vinegar Tasters scroll painting (classic version). Dimensions are about 2 feet wide and 3 feet tall for the actual painted portion. Add another 2 feet to the height if you include scroll portion. Note that this is a laminated POSTER, not a scroll. The coloring of this digital reproduction may vary from image shown. Dimensions: 2 feet wide and 3 feet tall approximate. Click on the "Buy Now" button for the scroll painting instead of this one if a scroll is what you want. 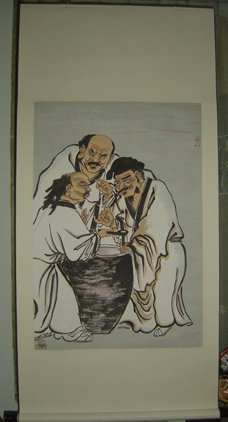 The following are the first 100 owners of the classic limited edition serialized paintings of the "Three Vinegar Tasters" by a master painter in China. Purchase now to get your own serialized version of the Vinegar Tasters. To see more serial numbers of other owners, visit Donors and more owners of Vinegar Tasters scroll painting. 36 states (plus Washington DC) from USA have a Vinegar Tasters scroll. Also one to each of FPO, AP and FPO, AE addresses. Only 14 more states left. 15 countries (including USA) have purchased a scroll. 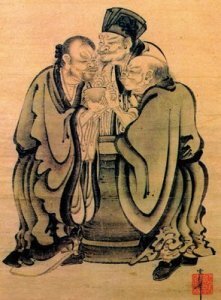 Here are the immortal people who have limited serialized paintings of the "Three Vinegar Tasters" in Robes by a master painter in China. This particular version of the "vinegar tasters" emulates the original painting made by Kano Motonobu (1476-1559) during the Muromachi Period (1336-1573) in Japan. Kano Motonobu is the son of Kano Masanobu, who founded the Kano school style of painting. The original painting is currently in a private collection. 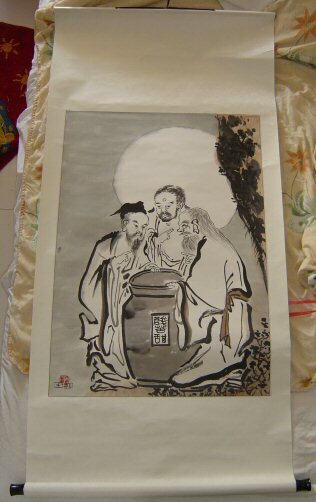 Clicking on the "Buy Now" button above to purchase next available serial number of this scroll painting. An alternative version. Note that this is a POSTER, not a scroll. The coloring of this digital reproduction may vary from image shown. 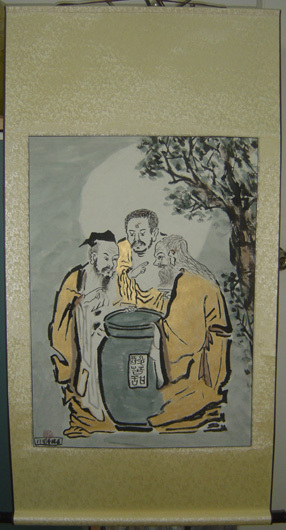 The history of the Vinegar Tasters painting starts with the three sages: Confucius, Lao Zi, and Buddha, who each founded a philosophy or religion that affected China profoundly (Confucianism, Taoism, and Buddhism, respectively). 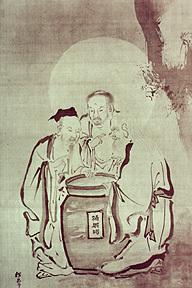 Paintings depicting these "Three Sages" together later became very popular among artists. During the Zhou Dynasty in China (1121 BCE to 255 BCE), three important sages left their wisdom that later affected a lot of people in the course of history in China. This meeting of the "Three Sages" together is hypothetical because Buddha was in India (not China) at the time. 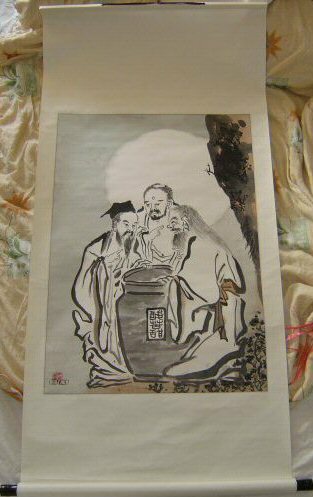 Around 1000 years later, paintings with the subject "Three Laughers Over Tiger Ravine" became popular (similar theme to "Three Sages"). 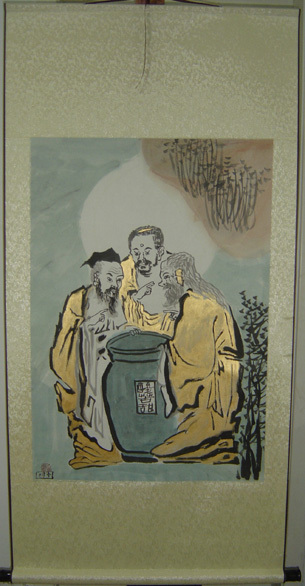 However, the three people in this "Three Laughers" painting are now Tao YuanMing (a poet: representing Confucianism), Lu XiuJing (a Taoist scholar: representing Taoism), and HuiYuan (a monk: representing Buddhism). During the Eastern Jin Dynasty in China (317 CE to 420 CE), Tao YuanMing and Lu XiuJing visited HuiYuan at the DongLin temple on the slope of Mount Lu (in JiangXi Province near Lake PoYang). HuiYuan religiously vowed never to cross the stone bridge over the Tiger Ravine because it leaves the Buddhist monastery compound. 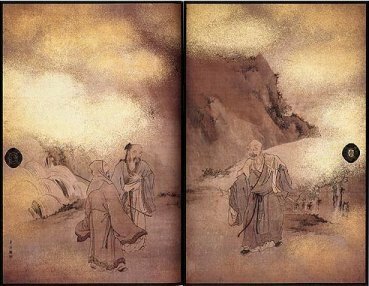 However, in deep conversation with Tao YuanMing and Lu XiuJing about Confucianism and Taoism, HuiYuan crossed the bridge with them inadvertently. Upon realizing this, the three laughed out loud. This meeting is hypothetical because if they actually met together, the oldest that Lu XiuJing could have been was 10 years old. 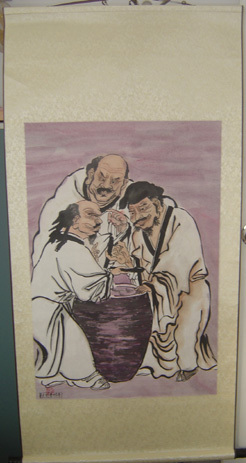 About another 600 years later, paintings with the subject "Three Sages Tasting Wine" became popular (similar theme to "Three Laughers"). 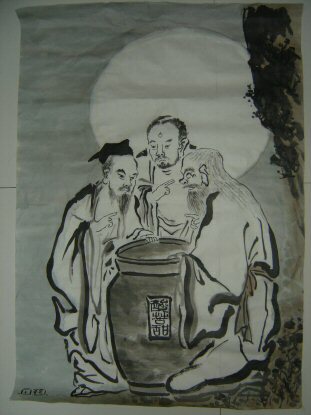 However, the three people in this "Three Tasters" painting are now Su DongPo (representing Confucianism), Huang ShanGu (representing Taoism), and FoYin LiaoYuan (representing Buddhism). 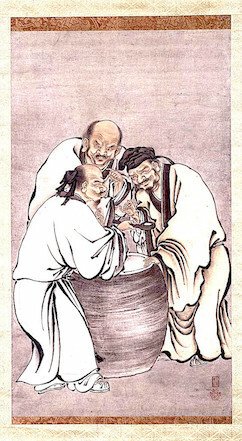 During the Northern Song Dynasty in China (960 CE to 1127 CE), FoYin LiaoYuan brought out a large vat of peach wine to welcome Su DongPo and Huang ShanGu visiting him in JinShan Monastery (in JiangSu Province, within ZhenJiang city). The three tasted the peach wine with fingers, and the translation became "Three Vinegar Tasters" because it was similar to vinegar in taste. Peaches are a native fruit of China and is very popular there. Shou Xing (Longevity God) often carries a golden peach to represent immortality.